Classical music for kids is enjoyable, relaxing and soothing. Studies have shown that classical music can also have a positive effect on the brain and can make people and children more intelligent. No wonder then that there is an emphasis on classical music at schools and why children are being encouraged to play a musical instrument from an early age. There are many classical music for children CDs that you can get. We have selected a few ones that are not only very popular and good value for money but also beneficial when it comes to their educational value. The first CD that we recommend is part of a series of albums called the “Mozart Effect” by Don Campbell. Don Campbell has spent years trying to make classical music a source of development and growth. He wrote many books about the positive effect on the brain that classical music can have (also how it can be a source of healing). He also produced many albums also called the “Mozart Effect”. We recommend the Mozart Effect Music for Children Volume 2. It contains a selection of beautiful Mozart pieces that are soothing (great for children that are agitated or that have a hard time getting to sleep), that help children concentrate and that introduce them to the music of Mozart. The second CD with classical music for kids that we recommend is 25 Children’s Favorites. The difference with the previous recommendation here is that it doesn’t only contain Mozart pieces but a variety of composers. The pieces were picked to include a wide variety of musical instruments (solo piano, harpsichord). The CD also includes the well-know and wonderful Carnival of the Animals by Saint-Saens. The sound quality is also exceptional. Our third recommendation is actually not only a CD but a CD with a book. It is called the Story of the Orchestra: Listen While You Learn About the Instruments, the Music and the Composers Who Wrote the Music. It is recommended for children ages 8-12 but we believe that a child younger than 8 can also appreciate it. 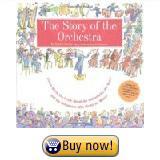 The book teaches about the various musical instruments used in an orchestra, the biography of the composers and it explains the various music styles (for example, Baroque, Classical, Modern, etc). The illustrations in the book are beautiful and the accompanying CD allows children to listen to musical selections included in the book (for example, the book would explain what a cello is then kids would hear a cello piece on the CD). Overall, a fantastic book and CD and a must have at home for adults or children interested in classical music.